← If there’s a chance the church isn’t true, would you want to know? I don’t think I was familiar with the analogy of “the shelf” until I became disaffected from Mormonism. The idea is that while a member, you might learn something about the church or you might have some doctrinal question that you can’t find a good answer for. So, you put it on your metaphorical shelf, and you hope that one day you can find an answer, or that maybe later in life you won’t care about it anymore. 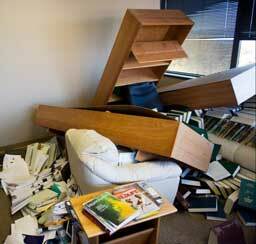 At the time I realized the church wasn’t true, I experienced what ex-Mormons call the collapse of my shelf. All the things I had learned in the church that I couldn’t find answers were on my shelf, and then they all came crashing down. I felt like I needed to deconstruct the mess my broken shelf had made. As I thought about it, my shelf had held a lot of stuff. When my shelf broke, it made quite a mess. How did Adam and Eve populate the world having lived only 6,000 years ago, all while starting in Missouri? How does it work that D&C 77 says the earth has a temporal existence of only 7,000 years? Why were the priesthood and temple blessings denied to people of African descent until 1978? How did the Nephites and Lamanites become so populous so quickly? Why did Jesus Christ destroy so many cities and kill so many people in the New World after he died, but didn’t do anything to the people in the Old World who actually killed him? Why is there zero evidence of the Nephite/Lamanite civilization? Where’s the DNA, the artifacts, or the influence of the Hebrew language on Native American languages? Why did Nephi have to decapitate Laban? Besides killing a defenseless man, didn’t it make a mess on Laban’s clothes that Nephi then put on? How did Mormon get Paul’s sayings on charity so that he could put them in the Book of Mormon? How were the barges in Ether supposed to work? Just a couple of holes for air, one in the top and one in the bottom? Why did Brigham Young teach the Adam-God theory and yet it’s disavowed today? There’s probably more. Sometimes the stories in the Book of Mormon sounded like a fantasy to me, like if you tried to act them out in real life it would seem ridiculous. But, I believed it was true, and did my best to be a good member of the church. When my shelf crashed, I went back and thought of those things that had troubled me, or made me wonder. But now instead of trying to figure out bad apologetics from places like FairMormon.org for these things, the answers were very easy: Joseph Smith wasn’t a prophet. He made it all up. He may have thought he was inspired (more on that in a later post), but he wasn’t. There were no Nephites or Lamanites. Jesus Christ didn’t kill thousands (or millions?) of people in the New World. The temple ceremony is similar to the Freemasons’ ceremony, because Joseph Smith learned it, put his own spin on it, and claimed God revealed it to him. Blacks were denied the blessings of the priesthood and the temple because early church leaders were racist. Of course the barges in Ether wouldn’t work. Boats full of animals and people, for 344 days, with just a hole in the top and bottom to get rid of the waste, to get more water? No. Adam and Eve were a creation myth, and Joseph Smith wove in the story of the Garden of Eden starting in Missouri because the church was in the area at the time. Humans started in Africa some 200,000 years ago, and there have been humans in the Americas for 16,500 years or more. Did the people who lived 6,000 ago years not have souls, and then their children magically had souls? Nope. Brigham Young likewise wasn’t a prophet, so he was free to teach crazy things that don’t line up with the scriptures. Having my shelf crash was painful at first, but where I’m at now requires no mental gymnastics. There are still things I don’t know, like is there an afterlife? I hope there is. But I’m OK with not knowing. I don’t believe it’s possible to know one way or another, so it doesn’t make me lose any sleep over it. I know my love for my family is real. I know that if I live a good life I’ll be happy, and I can make a positive contribution to the world. I no longer need a shelf to hold things that don’t add up, and I’m thrilled with that.